This grows even without rains,” says Mahendar Reddy, while he shows a tender moringa pod at Rythu bazaar, a farmers’ market in Hyderabad. In June 2015, the 29-year-old farmer from Telangana’s Damastapur village decided to ditch his tomato plantation for moringa, a drought-tolerant deciduous tree that is native to the Indian subcontinent. Like Reddy, farmers across Andhra Pradesh, Telangana, Karnataka, Tamil Nadu and Gujarat are ditching traditional crops to grow Moringa oleifera, the pod of which is popularly known as drumstick. According to an industry report in 2015 titled Present and Future Dynamics of Global Moringa Market, India produces 1.2-2 million tonne moringa every year making it the largest producer of the crop in the world. The country is also the largest moringa exporter and meets 80 per cent of its world demand, says the report. The new-found popularity for the vegetable is understandable when one considers the fact that India suffered two consecutive droughts in 2014 and 2015, which badly affected farmers. In fact, drought-tolerant crops hold the key to several problems associated with droughts such as threat to food security and livelihood opportunities. What is surprising though is that while the business of moringa is thriving, other drought-tolerant crops, many of which have been a part of our culture for centuries, have failed to take off. The most obvious example is tamarind, a food item which is an integral part of the Indian cuisine. Believed to have originated in Africa, production of the hardy Tamarindus indica started to peak in the 1990s in India. 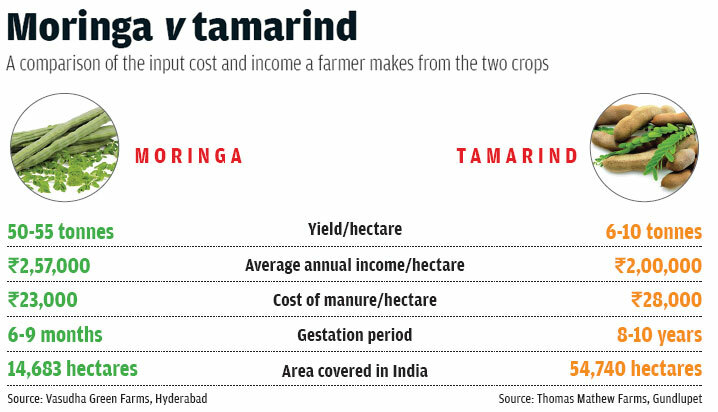 But in the past six-seven years, the area under tamarind has dropped by 10 per cent. Its production too has stagnated at close to 200,000 tonnes during the same period. A closer look at the two trees explains why the demand for one has gone up and has slumped for the other. The current size of moringa’s global market is over $4 billion and it is expected to cross $7 billion by 2020, says D P Maharshi, CEO of Advanced Biofuel Centre, an agricultural biotechnology institute in Jaipur which organises an annual international workshop on moringa. 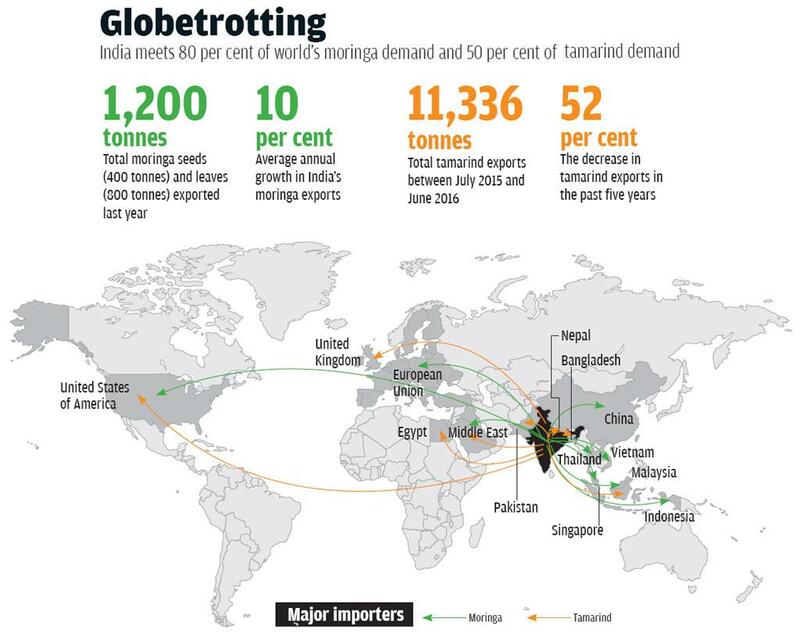 He says that this is because of an increasing demand for moringa products in developing countries like India, China and Brazil (see ‘Globetrotting’). “Last year China procured huge quantity of moringa seeds from India at Rs 3,000 per kg while the usual cost is between Rs 800 and Rs 1,000 per kg. This shows the great demand for moringa in the global market,” says Anil Ayyangar, an IT professional who recently launched a start up called Dr Moringa’s with partner Damyan Reddy. Almost every part of the plant is being sold in the market today. While fruits, leaves and flowers of moringa are used in the food industry, its seeds are being used to produce bio-fuels. Dr Moringa’s, for example, uses moringa leaves to make cookies, tea and ready-to-cook cereal. National and international companies and startups alike are all trying to get a slice of the moringa market, something that is missing in the case of tamarind. This remains one of the main reasons for the stagnation of tamarind production. It is still largely sold in retail in small quantities for domestic consumption, says Vinod Kumar Gupta, manager of Delhi-based Garg Traders that deals in tamarind among other spices and condiments. “Some manufacturers have tried to diversify by introducing tamarind products like seed kernel powder, fruit pulp and even syrups but these rarely got popular because processing tamarind is expensive and consumers don’t want to pay the extra cost,” says Gupta. Amit Bhatnagar, executive manager of the Tribal Cooperative Marketing Development Federation of India Limited (TRIFED), says tamarind jams and juices are quite popular globally, but in India the potential just has not been developed. “At current prices and considering the investment required for food processing, it is probably just not economically viable to expand,” he says. A similar state of neglect afflicts the pharmacological utility of the plant. “Tamarind has been known, right through the ages for its medicinal properties. Several of these properties have been tried and tested. There is great potential and yet, as far as I am aware, there has been no attempt to integrate these properties with western medicine in a marketable way,” says Milind Parle, dean of the faculty of medical sciences at the Guru Jambheshwar University of Science and Technology in Hisar, Haryana. The tamarind tree has been used for its properties as a disinfectant, laxative, antioxidant and pain killer. Different parts of the tree have been effectively used for treatment of malaria, diabetes, diarrhoea, asthma and snake bites. But at present, the processing capacity is not available and this is a gap that might take a while to fill. Unlike tamarind, moringa leaves, flowers and fruits are being used extensively in health products because of their high nutritional value. “Mostly people consume just the pods, but leaves and flowers also contain vitamins, minerals and iron which can be used to treat malnutrition,” says nutrition expert Salome Yesudas. The biggest reason moringa is gaining popularity world over is because studies have been carried out over time that prove its biological, nutritional and health-promoting properties. At present, there are over a thousand scientific articles on its health and wellness benefits. A study published in 2014 in the International Journal of Scientific Study found moringa leaf can cure malnutrition in children. The study was conducted in Karnataka and it found 52 per cent of the children who were given moringa gained weight in just two months. Even the most commonly used moringa variety in the country today is a hybrid that has reduced the flowering period of the tree from four years to six months. The PKM-1 moringa variety was developed in 1989 by Tamil Nadu Agricultural University’s Horticulture College and Research Institute in Periyakulam. The variety not only grows quicker but also has a high yield of 50-55 tonnes per hectare. A higher yielding PKM-2 variety was introduced in 2000, but it failed to pick up because of the big size of the pods that made transportation difficult. While PKM-1 pods are 75 cm long and there are about 218 pods per tree, PKM-2 pods are 125 cm long and there are 220 pods per tree. G Rajashekar of the Centre for Sustainable Agriculture in Secunderabad, Telangana, says another reason farmers are happy with moringa is that it requires very little fertiliser and chemical pesticides. “It is only infested by one pest called hairy caterpillar which can be controlled by non-chemical methods. Even if a farm does not have irrigation facility, the yield declines but the plant survives,” he says. (See ‘Moringa v tamarind’,) Tamarind production, on the other hand, has largely remained traditional, which is labour-intensive and has a long gestation period. This has happened because tamarind research in the past 30 years has been at best sporadic. With an eye to increase the dependability of farmers on tamarind as a dry land crop, Pune-based BAIF Development Research Foundation was among the first organisations to experiment with domestication of the tamarind plant as a cultivated crop. “Tamarind offers great potential as a dry-land crop since investment is one-time and the harvest is life-long with negligible loss in productivity as the tree gets older. It is a great option to be grown to supplement seasonal crops,” says Narayan Hegde, principal adviser at the foundation, which conducted various projects starting from 1985-86 in Karnataka to 2006 to introduce tamarind as a cultivable option to farmers. The idea was to collect good germplasm, clone the genotypes through grafting and distribute them among farmers. “We even isolated genotypes from five varieties that offered good returns. The project was discontinued since there are several other challenges,” says Hegde. For one, mechanical harvesting is extremely difficult. Another issue is the long gestation period of 8-10 years before the first yield. Most farmers are not willing to or simply cannot afford to wait for so long. Institutes have also experimented with efficient varieties of tamarind to make it economically viable for farmers. Among the newer attempts to do so is the Institute of Forest Genetics and Tree Breeding (IFGTB), which has done research on sweet and red tamarind varieties. A research team at IFGTB’S Coimbatore facility has tried to expand the scope of tamarind beyond the kitchen to industries. “Lack of commercial value has contributed greatly to the underutilisation of the tamarind plant. 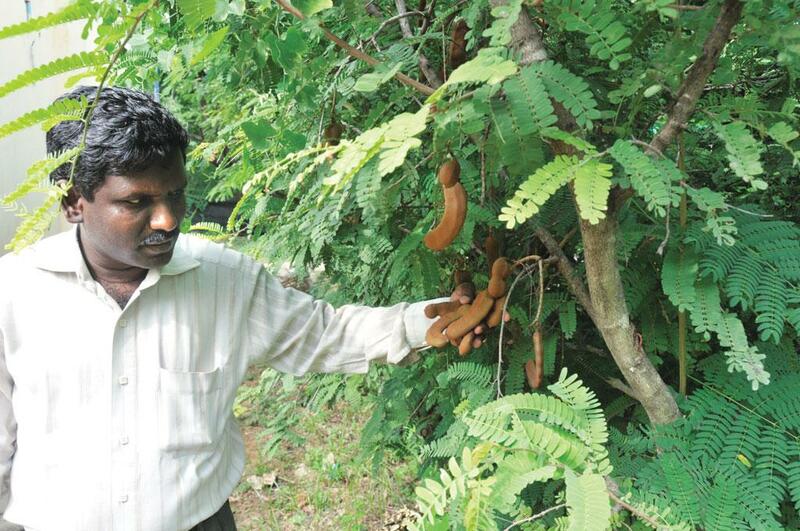 So we narrowed down to two main characteristics—colour and sweetness, while choosing the genotypes to be used to create grafts,” says A Mayavel, a scientist working on tamarind at IFGTB. The red variety can be used in the dyeing and food colouring industry due to the presence of anthocyanin, while the sweet variety, with close to 45 per cent sugar content, is ideal for food processing and domestic use. After over two years of surveying villages in Karnataka, Tamil Nadu and Andhra Pradesh, IFGTB selected 47 specimens of red tamarind and 30 varieties of sweet tamarind. The selected genotypes have been grafted and close to 3,000 grafts were distributed to farmers in 2012-13 for plantation on an experimental basis. “According to our estimates each tree could give an income of anywhere between Rs 8,000 and 10,000 per year compared to an income of less than Rs 4,000 per tree per year from inferior qualities. We still have to wait a year or so to gauge the success of the experiment, but the initial indications are good,” says Mayavel. Thomas Matthew, a farmer from Karnataka’s Gundlupet town who is part of the IFGTB experiment, says, “I planted the grafts about two years ago and the plants are coming up really well. I am hoping I will get 60 kg per plant at the first harvest. I have found it good for intercropping. It has a great survival rate in a rain-scanty area like Gundlupet and the fruit has a long shelf life.” IFGTB is also creating hybrid varieties of red and sweet tamarind with high yields although this is still in the nascent stages and would take “7-10 years for distribution and cultivation to begin”. In the absence of reliable farm varieties of tamarind, the tree still primarily remains a minor forest produce and is at the mercy of the forest department. “Since timber fetches better money, forest department is more interested in it. So, the number of tamarind trees in the forests is reducing. Although timber might offer better income, tamarind and other seasonal forest produce are much better as livelihood options for forest communities,” says Amar Gouda, regional manager of the Regional Cooperative Development Corporation in Balangir, Odisha. In fact, informal agricultural workers and tribal people constitute the bulk of tamarind collectors. 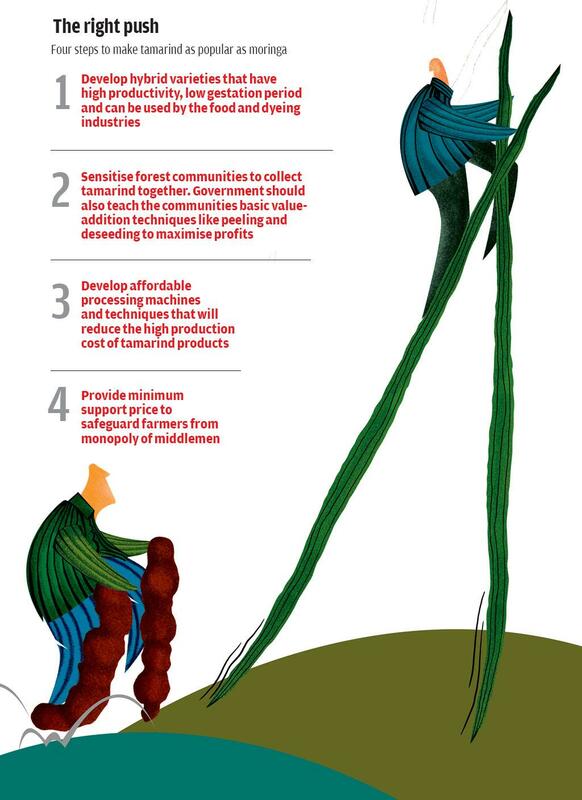 “The Forest Rights Act confers ownership rights on minor forest produce like tamarind on tribal populations and residents of the particular forests. Today, about 90 per cent of the tamarind produced in the country comes from the forests,” says Bhatnagar. Tamarind works as a financial safety net for the collectors who sell the produce at weekly markets to private traders and middlemen. “Collection and sale of tamarind is done at both community and individual levels. In Chhattisgarh, 40-50 kg of fruit is sold at the weekly market per collector per week. The collected tamarind is then stored in a godown and sold to private bidders at the end of the season. The entire process is facilitated by the state and carried out by the state union of tamarind collectors,” says P K Panda, regional officer of TRIFED, working at Jagdalpur in Chhattisgarh. TRIFED currently buys tamarind in nine states at Rs 22 per kg, which tamarind collectors say is of great help. “The introduction of MSP for tamarind has helped us. Earlier, we would not get more than Rs 12 a kg,” says Sushma Dumdum, a tamarind collector from Sambalpur district in Odisha. Dumdum is part of a 104-member women’s self-help group that is involved in collecting seasonal forest produce throughout the year. “We usually collect close to 300 quintals (30 tonnes) of tamarind in a season. The earnings are equally distributed. This arrangement gives us livelihood support that is important to us,” she adds. But in states such as Jharkhand where TRIFED does not have an MSP for tamarind, the collectors are left at the mercy of middlemen. 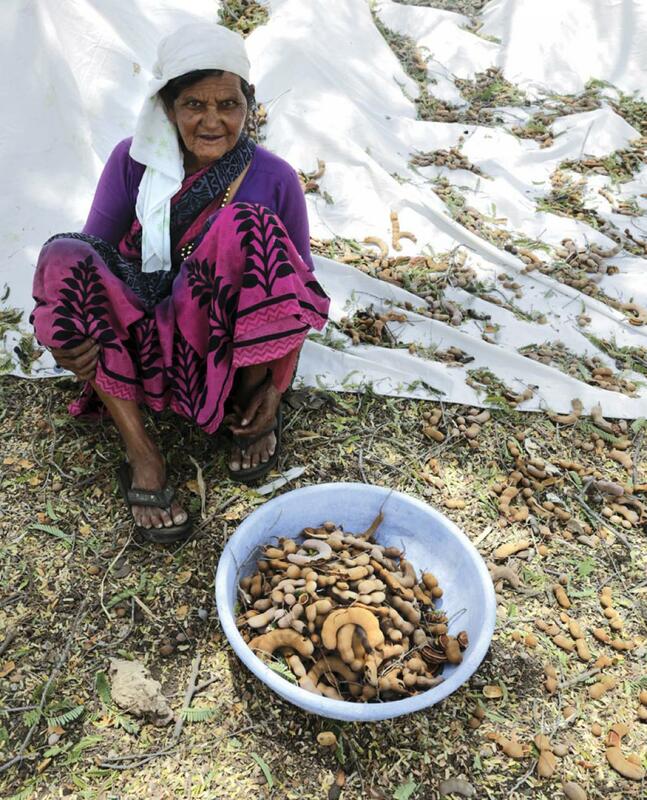 “We collect around 350 kg of raw tamarind every year during the season and sell it at the district centre during the weekly bazaars at Rs 16-20 per kg,” says Martha Toppo, who is one of the 12 women in Turidih village of Jharkhand who collect tamarind from around 30 trees in the vicinity. Like tamarind, the problem of middlemen also plagues moringa farmers who are mostly small and marginal and benefit the least. According to the Agriculture Census 2010-11, 47 per cent of the farmers who grew moringa were marginal (landholdings less than 1 ha). Small farmers, with landholdings between 1 and 2 ha size, accounted for 20 per cent of the share. The share of medium farmers with landholdings between 4 and 10 ha, was 12.4 per cent of the total area and that of large farmers was a miniscule 2.9 per cent. The farmers are not only losing out on their due, but are also unaware of it. The hand-to-mouth situation of farmers in the country keeps them so preoccupied that the idea of expansion seems like a distant dream. Mahendar Reddy says he is content with just recovering his investment on moringa because he was not even able to do that with tomato. Similarly, P Sreenivasulu from Rayalaseema is happy even with nominal profits in drought years. The two farmers earn between Rs 20 and 25 per kg at the local markets. 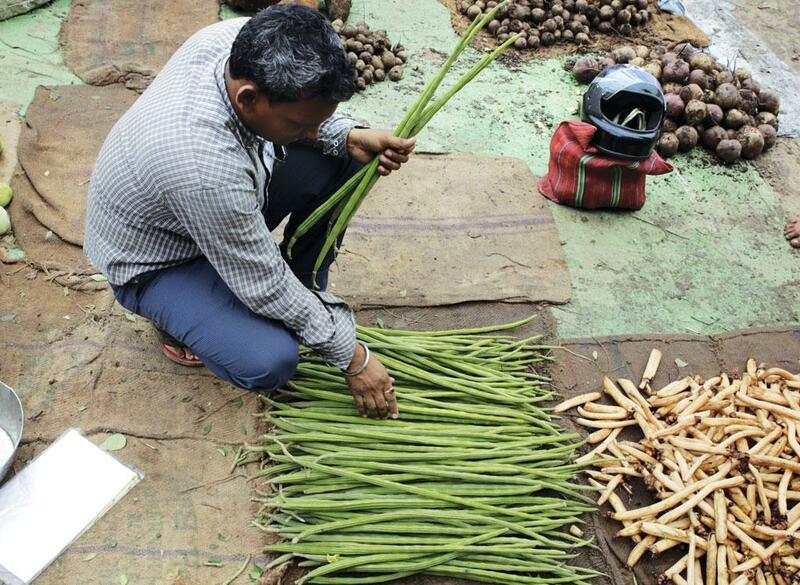 The price of moringa pods reaches around Rs 50 a kg when it finally reaches the city. In the case of tamarind, tribals rarely earn more than Rs 25-30 per kg regardless of the quality but tamarind can be retailed up to Rs 130 depending on the grade. “It is the middlemen who decide the price at the local market and the small farmers have no say in it. This happens because moringa is a perishable commodity and farmers cannot afford expensive storage options,” says T Rajendran, assistant professor, Agricultural College and Research Institute at Tamil Nadu Agricultural University. 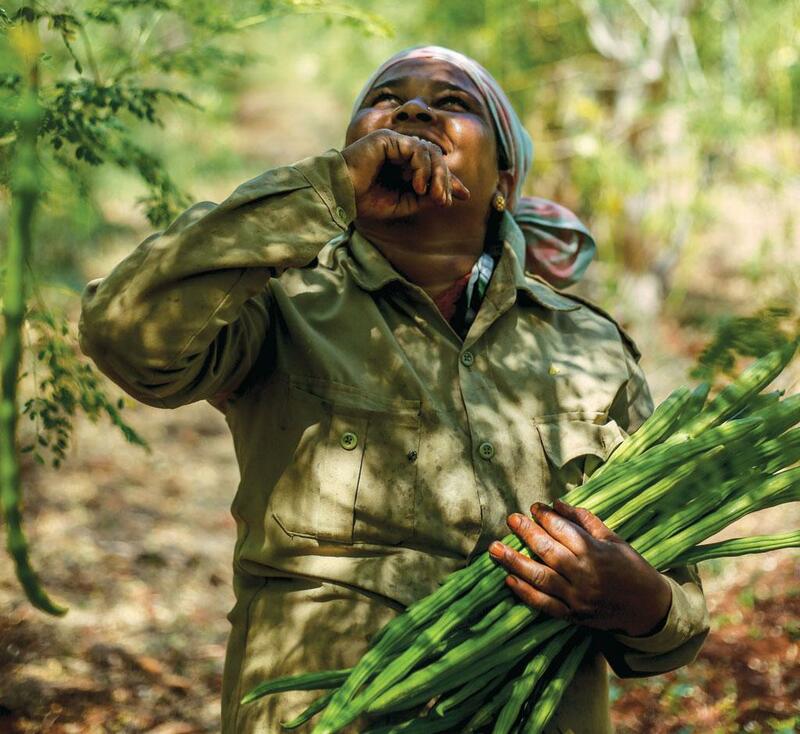 The middlemen then employ labourers to segregate and pack the produce in terms of quality and this process immediately increases the cost of moringa. Rajendran says this circle can only be broken if small farmers come together. “The government should educate moringa farmers about its value-added products and the supply chain management should be made efficient to ensure farmers get their due share.” Such education will also help farmers like Jayarama Reddy, who is already cultivating moringa in his 8.1 ha farm and wants to export the crop on his own. “I know that a single pod is sold for around 7 euros (Rs 520). I want to connect with other moringa farmers and form a group to export our produce. However, there is little awareness among small farmers on how to procure an export licence. There should be government support in terms of technical assistance to help farmers obtain exporting licence,” says the 32-year-old farmer. Experts also say another problem with both moringa and tamarind is the seasonal price fluctuations which leaves the farmers vulnerable. Moringa prices fluctuate between Rs 20 and 100 per kg within a year. This can be plugged if the government comes out with MSPs and subsidies. “The government promotes popular crops by giving hybrid seeds. If they can promote tomato and other crops, then why not promote moringa? It is a super food,” says Rajashekar. Experts also say the current demand for moringa is fuelled by international and not domestic popularity. The domestic demand of both moringa and tamarind should be pushed through proper government support and sensitisation of people. “Minor forest produce not only provide livelihood options to forest communities and small farmers, but also promise nutrition and health to people, especially during drought years. This is a major reason why government agencies and non-profits should try to popularise them,” says S Jansirani, head of the department of spices and plantation crops at the Tamil Nadu Horticultural University, Periyakulam. The government, in recent times, has been involved in training tribal population in simple value addition to increase the marketability of tamarind. “Our interactions with tribal collectors and their feedback have enabled us to impart some basic training to increase the profitability of tamarind collection. The motivation has always been there, but not the know-how and we have been looking to bridge that gap,” says Panda. The training improves hygiene and eases peeling, seeding and packaging into bricks for sale. Traditionally, collectors will smash the fruit with rocks to remove the peels and seeds, but under the initiative the mechanical process of deseeding is being introduced. “The training includes a small working capital of Rs 150 per person for self-help groups of up to 15 people which is deposited in the groups’ bank accounts and a deseeding machine to each group. These simple processes protect the collector against being cheated and also fetches almost double of what raw tamarind would have fetched in the market,” explains Panda. Although the government does not procure the seeds, some private dealers buy the seeds separately for around Rs 2 per kg. Another example can be found in Andhra Pradesh’s R Krishnapuram village where health workers are giving free moringa leaf powder to create awareness and impact community health. Behind the initiative is a self-help group called Shrisha, which has 10 women who collect leaves from moringa farms for free. The group now plans to start selling health products made out of moringa leaves. The good news is that such initiatives have started in certain areas, but a lot needs to be done to benefit the maximum from them. Superb article. hats off to you.